Construction on Dallas Pacific Plaza Park, designed by SWA, is scheduled to begin in early 2018 and is expected to last 12 to 18 months. Joni Mitchell, Dallas has heard you. The City Council of Dallas has decided to un-pave a 3.2-acre parking lot—in place since 1921—and put up a paradise in the form of Pacific Plaza Park. Nonprofit Parks for Downtown Dallas has been trying to swap hard top for green space in Dallas for several years. 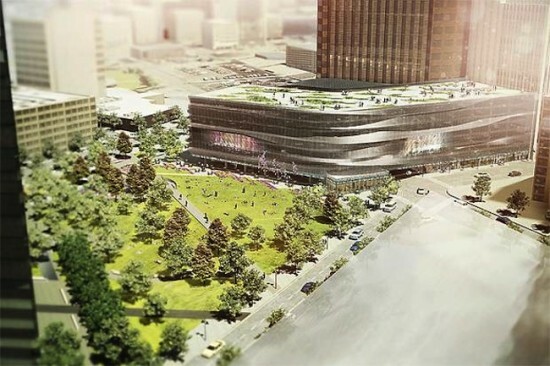 The group originally proposed donating $35 million to the city to fund the construction of four new parks in Downtown, including Pacific Plaza, with the caveat that the city would match them with $35 million to get the job done. 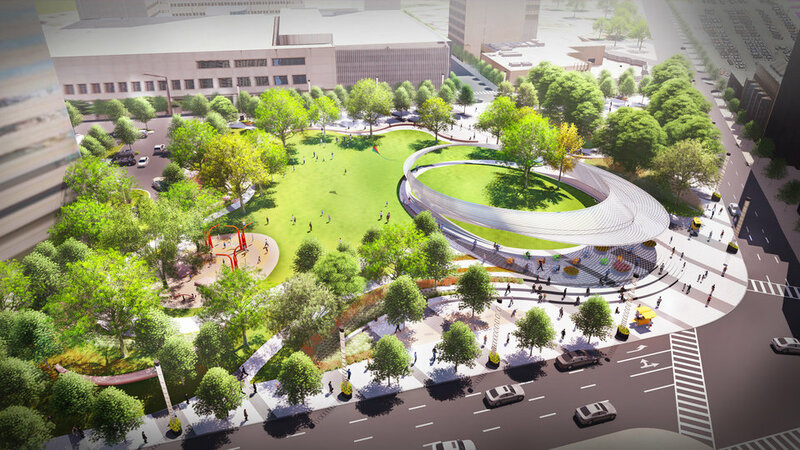 When for-profit 4P Partners proposed building an underground parking garage topped with a park on the site, located off Pacific Avenue, Parks for Downtown Dallas decided to shift around their funds and provide one hundred percent of the construction costs for the park. This move helped expedite the project. HKS Architects, whose offices are located in One Dallas Center adjacent to the site, also made a donation for the park’s construction. Landscape architecture, planning, and urban design firm SWA Group was tapped to design the project in early 2016. They approached the park from the perspective of the neighborhood, holding two public “envisioning sessions” to gauge the needs of the community before they began their designs. The main desires were for social connectivity and, of course, access to nature. With this in mind, SWA allocated an acre of open green space as the central portion of the park, flanked by rows of shade trees intended to buffer the park from its bustling surroundings. Live oaks original to Aston Park, a small park already on the site, will be absorbed into the landscape to preserve existing foliage. Walking paths weave through the trees and encircle the green space. A 670-foot-long stone seating wall, deemed the “thread,” helps stitch the various spaces of the park together. Additionally, a halo-shaped structure anchors the southwest corner and provides an opportunity for seating, shade, and socializing. Construction on the park is scheduled to begin in early 2018 and is expected to last 12 to 18 months. Although it has been a long fight to get Pacific Plaza Park underway, Parks for Downtown Dallas is still pursuing its proposal for three other parks in the Downtown as well. “Quality ‘green space’ is an asset wherever it is found,” said Chuck McDaniel, SWA Dallas managing principal. “During the next few years, there will be a chain of parks throughout downtown Dallas that will work together to cool the air, enhance the aesthetics of our city, and make downtown an even more livable and walkable place.” To learn more about the Pacific Plaza Park and the Parks for Downtown Dallas organization, you can visit their website here. Dallas developer Shawn Todd is proposing a $100 million parking-garage-and-park combo for a downtown parking lot that Dallas has been trying to get underway for years now. And while stories about parking garages aren’t exactly a dime a dozen, Todd’s plans are making a particularly idiosyncratic splash. Besides a massive media screen, a Trader Joe's grocery store, and adding a plethora of parking spots to downtown Dallas, the garage and park won’t cost the city a penny. Todd plans to pay for it all by himself. Pacific Plaza is a 3-acre lot in downtown Dallas that the city has been pouring money into for years now. But the city can’t foot the $10 million dollar bill required to get the park underway. The lack of funds has left the stretch of asphalt and broken concrete as, well, a stretch of broken asphalt and concrete. Todd wishes to build an eight-level parking structure that would arch over Pacific Plaza with a deck park atop the garage. Nearby Aston Park—which Todd hopes to buy out from the city—provides the footprint for more park space. Digital ticker tape similar to the one in Times Square gives the parking garage a revolutionary nod to modernity. Razing nearby Corrigan Tower and including residential opportunities is a part of Todd’s bold bag of tricks. Although the city would not have to pay for the rebuilding or maintenance of Aston Park, they are weary of selling the land to a private investor. However, nearby Klyde Warren Park employed a similar business model and was unquestionably successful, so negotiations are a definite possibility. Todd’s ambitious blueprints require some major red tape to cross before groundbreaking. Success, however, would be a big foot up in Dallas’ attempts to amp up their downtown area with commercial and economic viability.